The title and blurb for psy/changeling #13 is out! Copied from Nalini's Facebook page. And I hope she good and spunky and fierce and.. and.. and..
And lets please talk about that beautiful title. My protective baby.. who never wanted to be anything but a defender and was tortured and forced into being a killer. I have to say I'm even more excited about this book than I was either Kalebs or Hawkes. Vasic has always been my favourite character and he gets his very own empath. & I get to see more of Aden and Judd SQUEEEEEEEEEEEEEEEEEEEEEEEEEEEEEEEEEEEEEEEEEEE!!!!!!!!! Yessss! And am expecting bit parts from Kaleb, Judd and Aden! And if Ivy Jane's "medical “treatment”" is some sort of rehabilitation, she must be really ferocious to be able to have a life after that. And who identified the sleeper empaths in the Net? Presumably Kaleb Krychek -- with a little help from the NetMind that has been protecting the empaths. Insert meaningful, yet incredibly funny statement here. 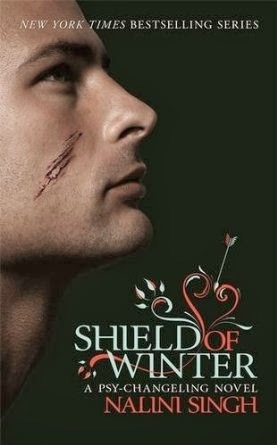 Nalini just posted the Shield of Winter cover for the UK. I wonder what the scratches mean. Like .. WHO DARED TO HURT VASIC? I am very curious if this book, like HoO, will focus almost entirely on the Psy (and for HoO in particularly two characters) or if there will be more of the larger world? I think in many ways HoO was a unique book and unlike most of the series, there were not many changes in the POV from the two main characters. I hope we revisit some of the past characters in Shield of Winter. I think it is likely as the fall of Silence will affect everyone, not only the Psy. 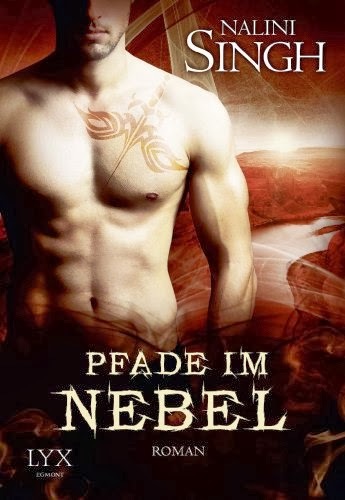 The German cover was announced mid-November, the tattoo does not look Psy at all. I like the UK cover much more than the German cover. There was a man standing on the path between the snow-kissed trees. No, not a man. A soldier. Over six feet tall with broad shoulders, his posture was unyielding, his stillness absolute, his eyes a chill gray, and his hair black. In the release of Whisper of Sin an excerpt for Shield of Winter is included. Those of you, who know me a little longer, know how absolutely partial I am to Vasic. Heck, even Nalini comments on it.... and this? This broke my heart and made me cry and.. I can't! last Monday, Nalini announced chances to win ARC of Shield of Winter. Has anyone joined? Also, the newsletter contains the excerpt that was included in the re-release. TheFLuff wrote: In the release of Whisper of Sin an excerpt for Shield of Winter is included. Thanks for the info, TheFluff. Really appreciate it. Wasn't interested in the novella as I'd read it before. but so much potential for Judd, Mercy finally finding out, who saved Dorian. Judd finding out, who saved his friend. Oh and Walker and Aden! I got the novella the moment you posted. and have finished reading the excerpt. Ok, re Walker and Aden, will the other Arrows find out how much Walker helped them by training Aden? I love how quiet and unassuming Walker Lauren is the base and the heart of the revolution. He trained Aden, who in turned saved the Arrows and got them away from Ming and made them work with the revolutionaries, at least Vasic and him. And yes, I think we can totally discuss it here. It´s only the beginning of that sad sad trip this book will be. Walker is Aden's guru, caring not just for his psychic training but also for his physical welfare. And that makes Walker the godafther of the quiet revolt of the Arrows. And beyond that, Vasic, as a Tk-V, appears to have the ability to identify any of the hidden E's. From what I read from the excerpt Aden was someone who needed the sability, Walker provided more than anybody else. Though, I am curious about those double abilities, it´s the same with Judd´s ability to lend psychic energy to someone... those pairing seem in no way connected. TK Cell with Psychic energy transfer, TK V with bein gable to feel ones emotions touched... what? the high powered TKs seem to have these adjunct abilities that do not seem directly related to their foremost strength. I'm really excited for the possibilities in this book! His name is Goran Jurenec, but he has the wrong color eyes, they're not grey at all. Want a picture of him in a black tshirt?